Reason Magazine's C.J. Ciaramella filed a Freedom of Information Act request with the FBI for the Bureau's file on TSR, the company that E Gary Gygax founded when he created Dungeons and Dragons (now a division of Hasbro). 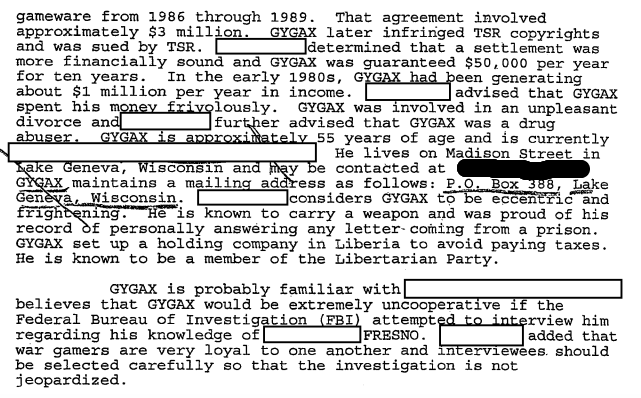 The file includes several paragraphs on Gygax noting "that Gygax was 'eccentric and frightening,' carried a weapon, proudly responded to every letter he received from an inmate, and had a Liberian holding company" and was "known to be a member of the Libertarian Party."